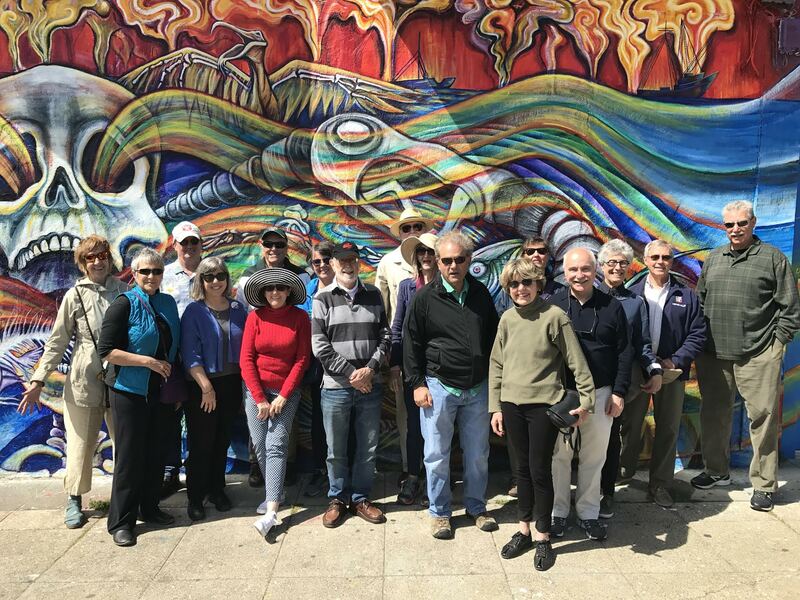 On April 3, 2016, I led a Friends of the Library walk along the Ashby corridor with a major excursion south on Shattuck. It was a beautiful April day. We met at Adeline and Emerson. 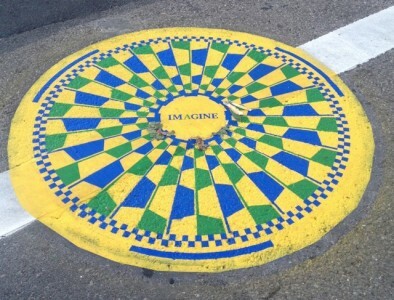 At Emerson and Adeline, you have perhaps seen the “Imagine” mosaic honoring John Lennon in Central Park, New York, based on a Greco-Roman design, a gift to New York from the City of Naples. The Berkeley rendition honors Ignacio “Fito” Celedón who was murdered on that spot in September 2010. His fiancée Amber Nelson commissioned the painting and created a small beautiful planting along the sidewalk fence. 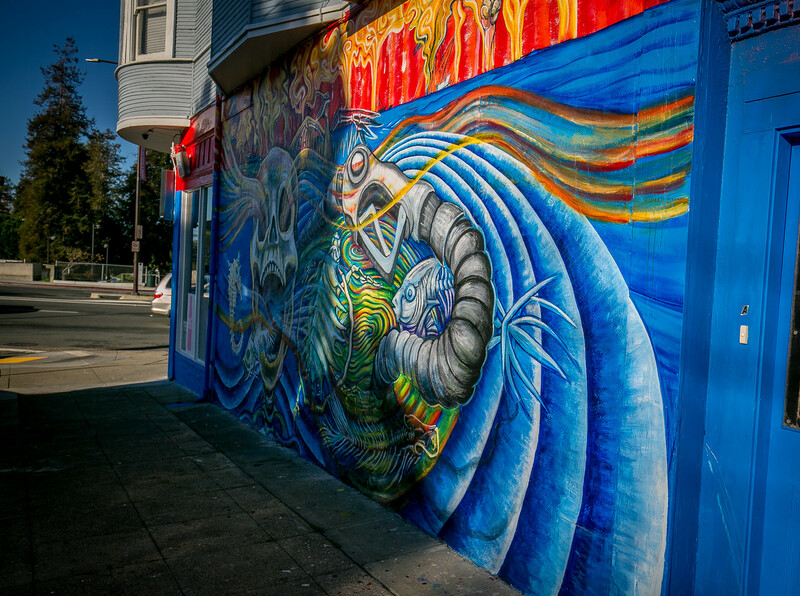 Across Emerson on the south-facing wall of Black and White Liquor are bright murals painted recently by Juana Alicia. 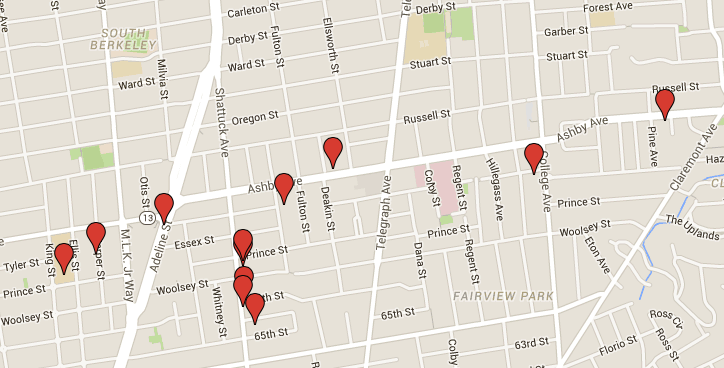 Go west on Ashby, cross Martin Luther King Jr. Way. Continue west on Ashby. Turn left (south) on Ellis. 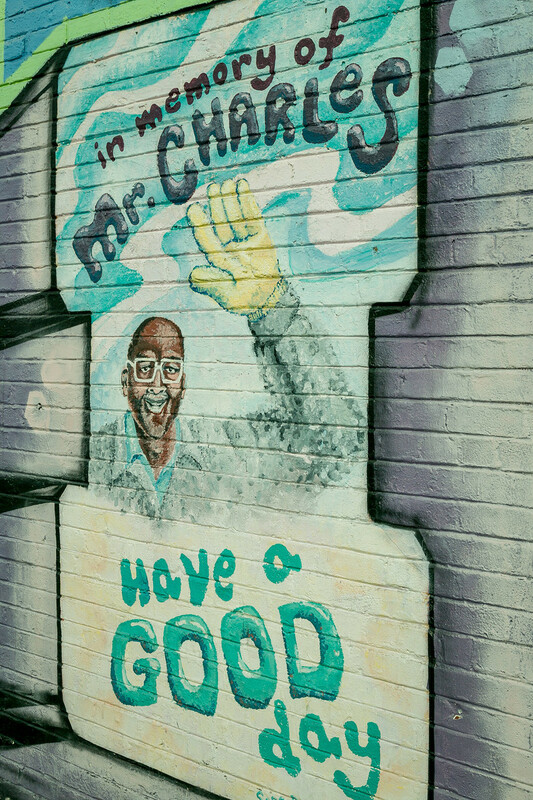 Malcolm X School Playground on Ellis Street just south of Ashby: Collaboration between Mark Bulwinkle and students. 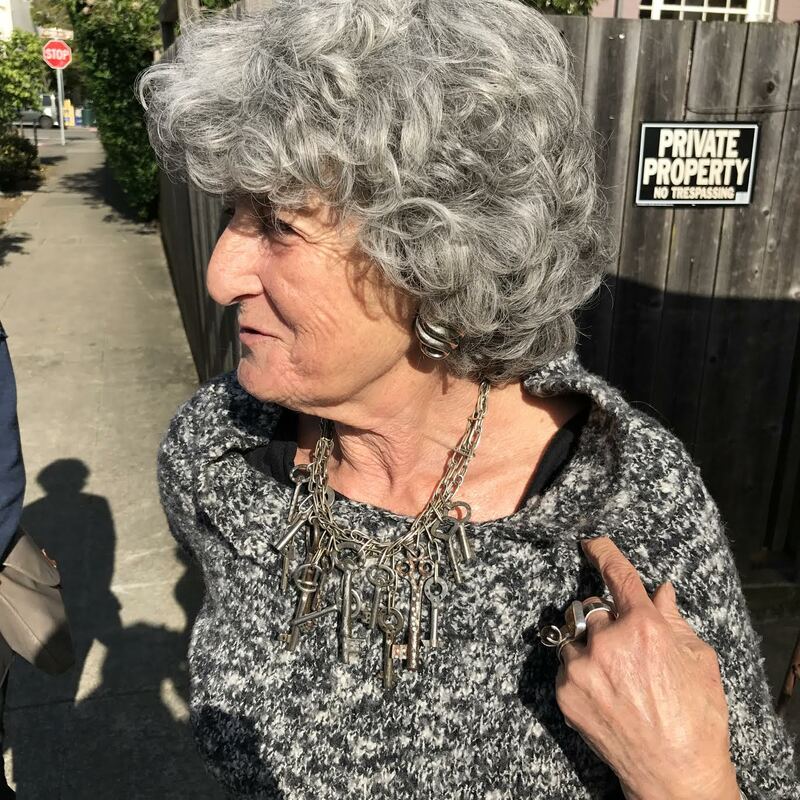 He writes about working with “Rivka Mason, Garden Godess and teacher at the Malcolm X School in Berkeley, California. 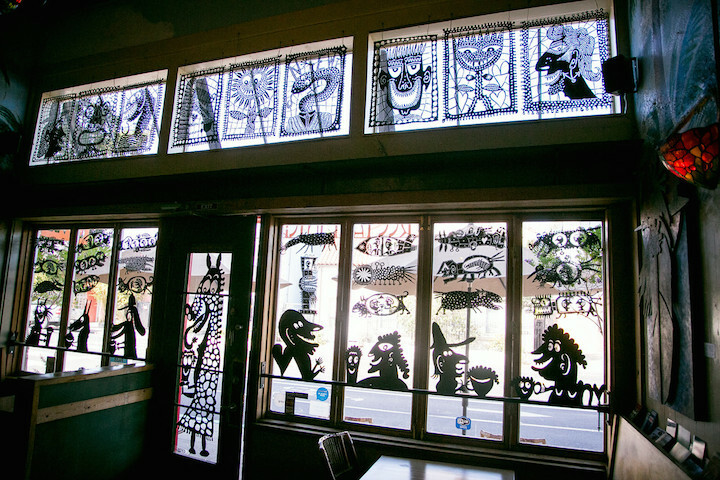 All pictures on this page are of the students’ imaginings, drawn directly on pieces of steel by those same students and cut out by the artist, Mark Bulwinkle and installed by him sometime in the early part of this millennium. Since all children’s art is timeless, it matters little when the art was done. My post on it is here. 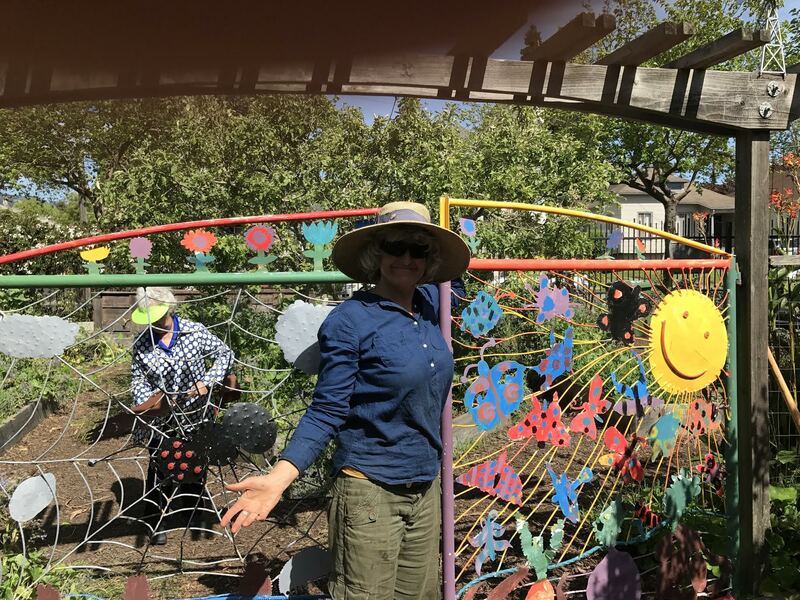 It happened that Rivka Mason, the teacher whose zeal and hard work made the sculptures possible, was there working with parents and grandparents on the garden. Turn around and go right (east) on Ashby. Turn right (south) on Harper Street. 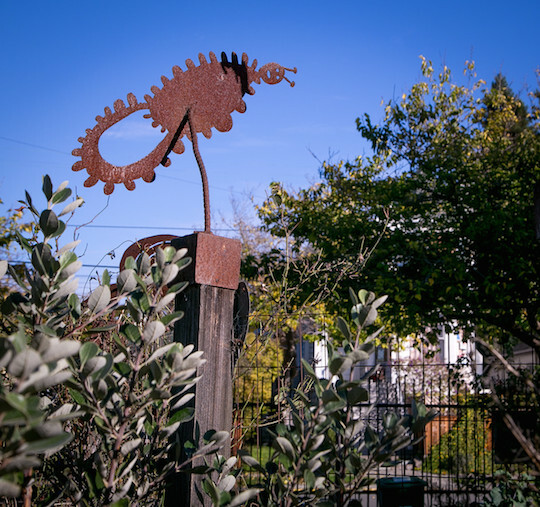 Eni Green’s Doxie Sculpture Yard at 3026 Harper Street. 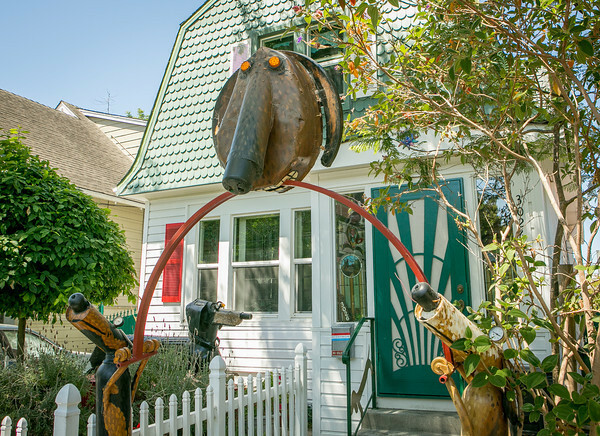 Works by Mark Bulwinkle and Patarick Amiot, and a Doggie Diner head! My post on Eni’s doxie house is here. Return to Ashby, go right (east) until Shattuck. Turn right (south) on Shattuck. On the west side of the street is the Bellisima Day Spa. Check out Buddha and Bambi. 3033 Shattuck: a liquor store and then a fish as in aquarium store and now a marijuana dispensary. 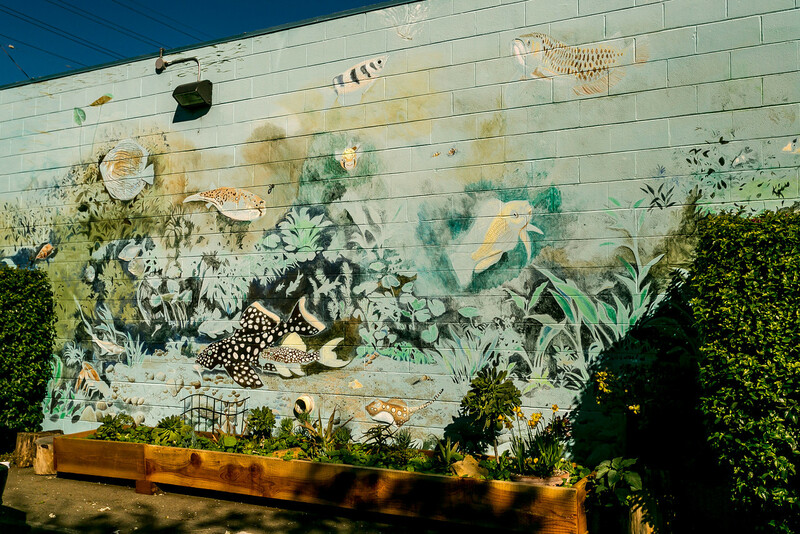 Wonderful aquatic murals. 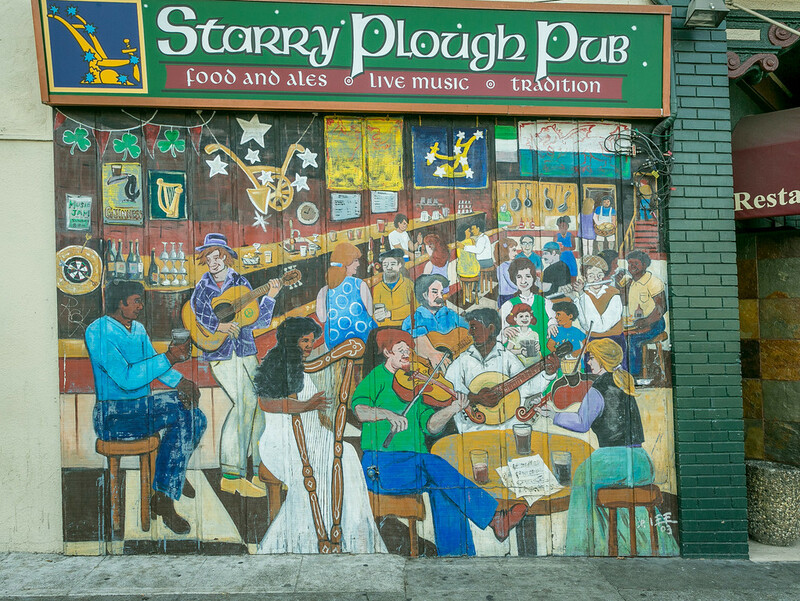 3101 Shattuck: Starry Plough. 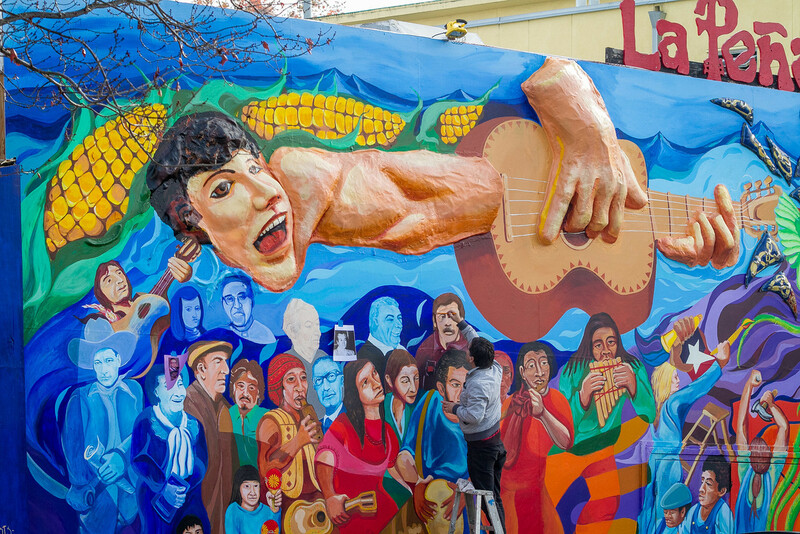 Murals celebrating struggle and music. The Starry Plough banner was first used by the socialist, Republican Irish Citizen Army during the 1916 Easter Rising. On the west side of the street is this lovely redwood picket fence. 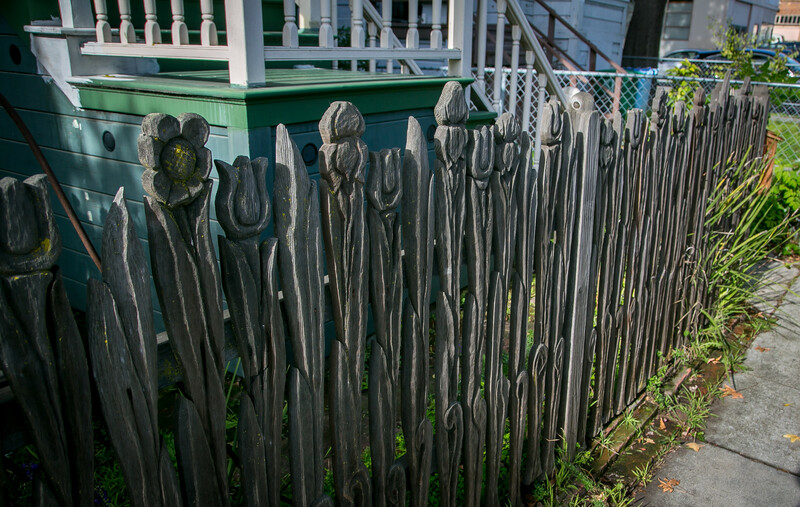 It was made by Sheri Tharpe and her friends and students decades ago, replicating a redwood picket fence in Kensington. My post on the fence is here. 3105 Shattuck: La Pena. 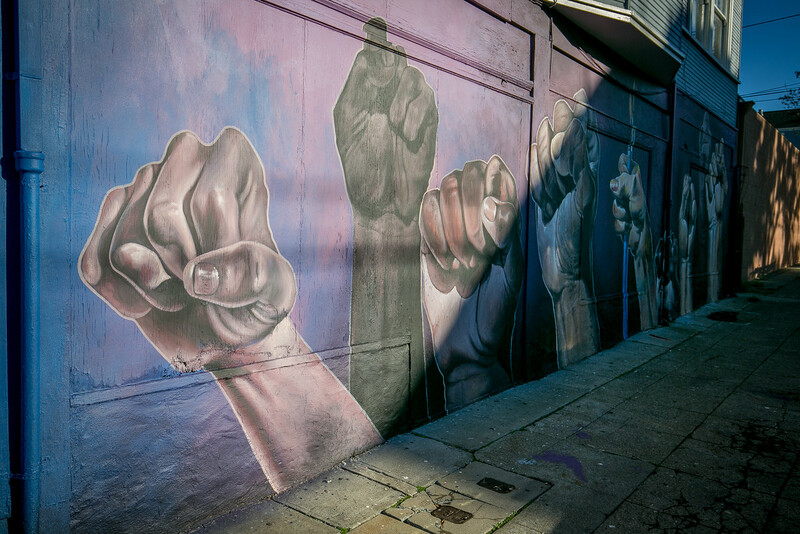 Another big-time Berkeley mural celebrating struggle. And, by the way, a really good cafe. Really good. There is a very cool fence across Shattuck. Worth noticing. Pretend that you don’t see the sign telling us that we are entering Oakland. Jumpin’ Java at 6606 Shattuck. 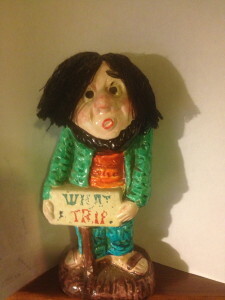 One of the single largest collections of work by Mark Bulwinkle. Bulwinkle and Jumpin’ Java owner Mike Dawoud are friends. Dawoud showcases local artists and there is a permanent showing of Bulwinkle’s work. He spoke to our group. My primary post on Bulwinkle, including Jumpin’ Java and Dry Garden, is here. Dry Garden Nursery at 6556 Shattuck. 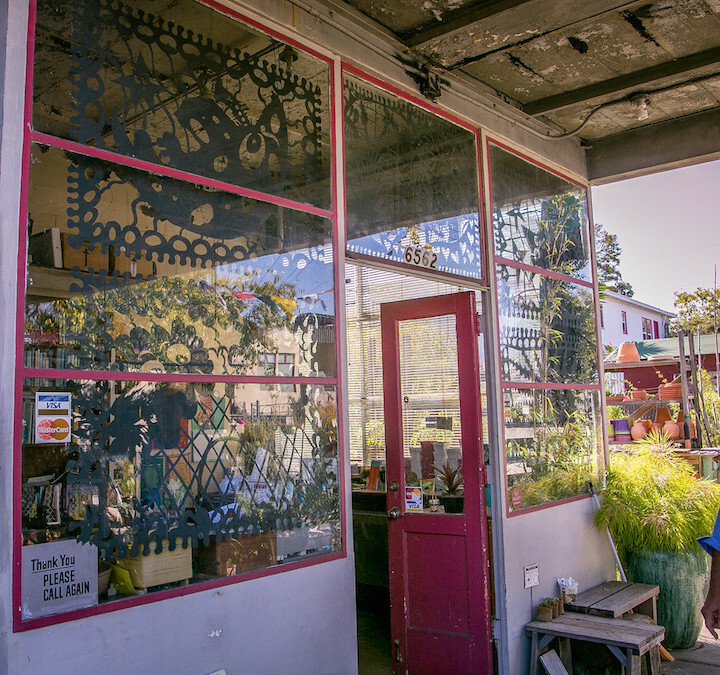 My favorite nursery in Berkeley. Another big showcase for the art of Mark Bulwinkle. It was closed – all who walked should return. Continue south on Shattuck. Turn left (east) on Fariview. Bulwinkle art at 689 Fairview. 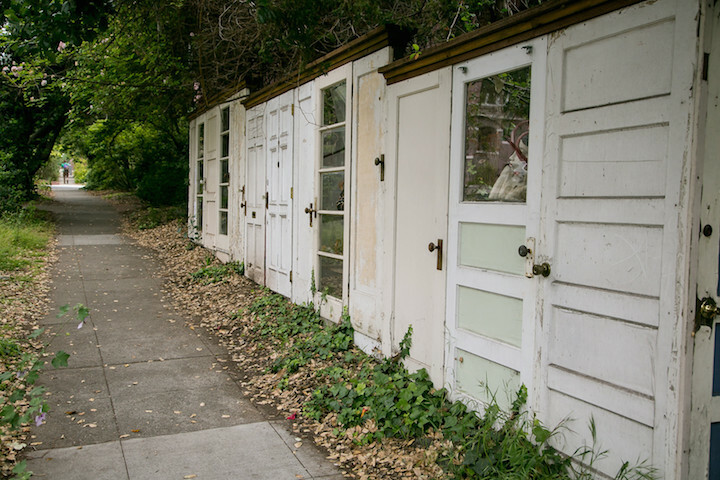 We’re on thin ice here with the Oakland thing so let’s dance and go another block into Oakland from Dry Garden. Return to Shattuck, go right (north) and then right (east) on Emerson. Emerson dead ends on Wheeler. 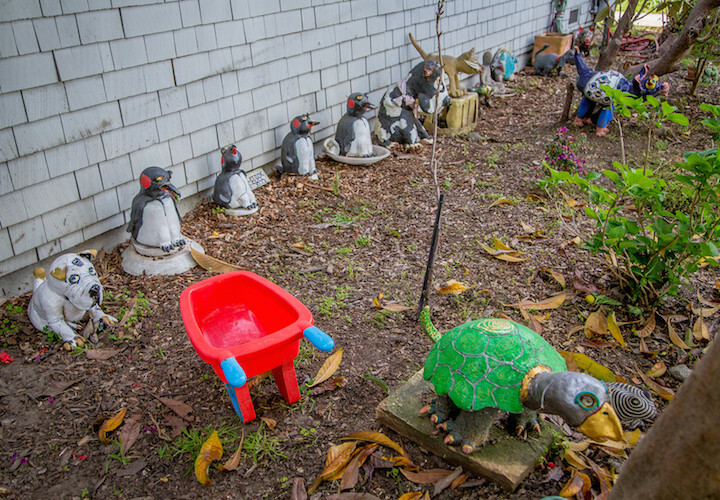 Marcia Donahue’s ceramics and garden at 3017 Wheeler. 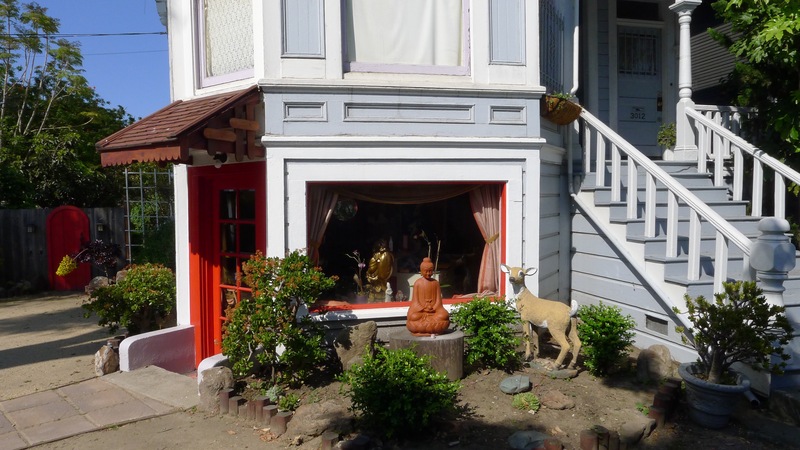 Donahue is the spiritual center of Quirky Berkeley. 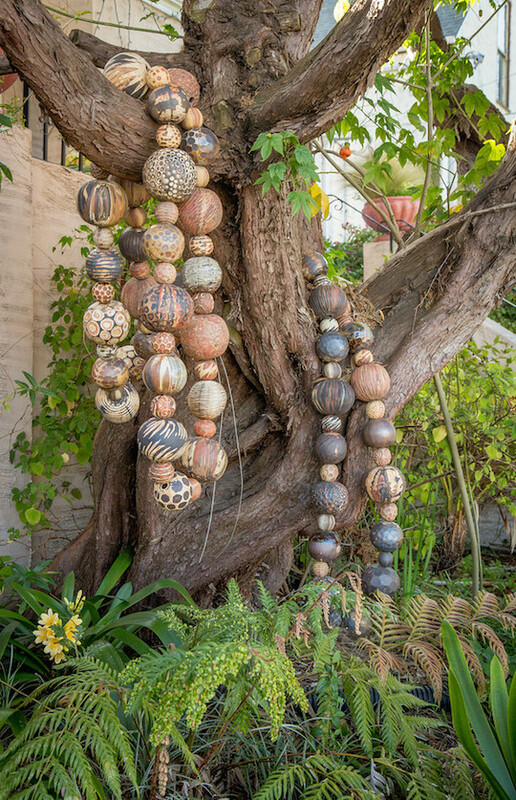 An ultimately inspirational garden and ceramicist. Her garden is open Sunday afternoons to the public. We briefly toured the garden and all were inspired. My post on Donahue is here. Turn right (north) onto Wheeler from Donahue’s and proceed to Ashby. Turn right (east) on Ashby. Slingshot Collective at 2231 Ashby. 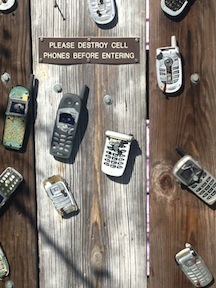 An anarchist collective with a sense of design to express their distrust of mobile telephone technology. It is known as the Cathaus. Cross Telegraph (restrooms at Whole Foods). Turn right (south) on Regent. Turn left (east) on Webster. Ceramics at 2526 Webster. I don’t know the story here. 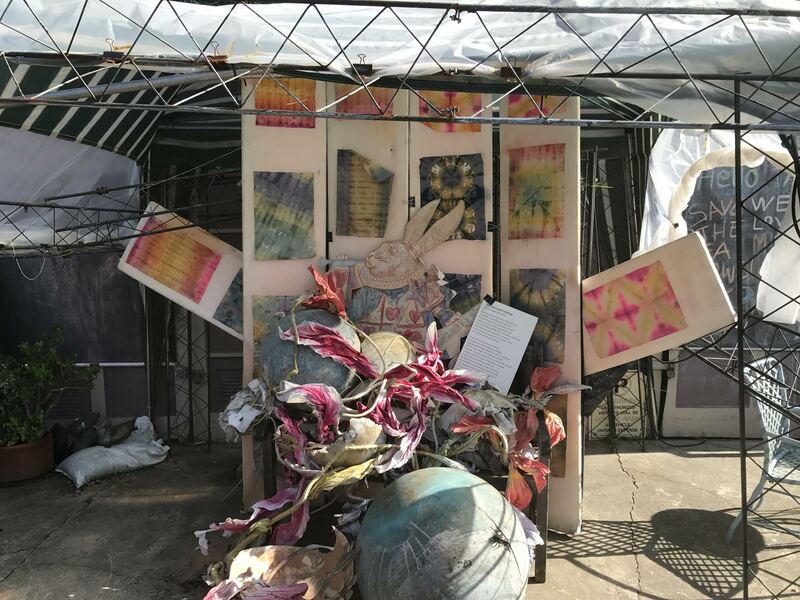 The installations of Julie Partos at 2634 Webster. Julie Partos has a pop-up tent in front of her house and creates ever-changing installations. Who knows what we will find. I hope we see her. She is a trip. My post on her is here. Her current installations based on “The Second Coming” by Yeats. Julie Partos greeted us, wearing a necklace made with keys that she gathered in Budapest last year. Continue up (east) Webster to College, turn left (north). 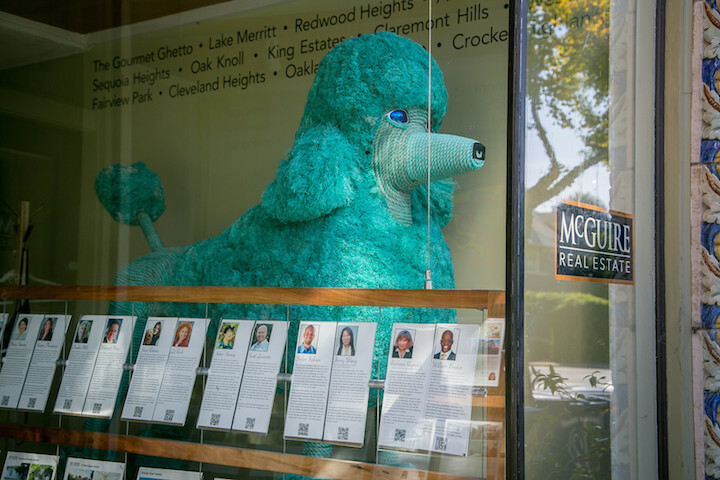 McGuire Real Estate at 2991 College. Often a showcase for a piece of Mark Olivier’s beach detritus art. The last time I went by, “Best of Show” was in the window. We stopped here. If we had continued, we would Turn right (east) on Ashby. 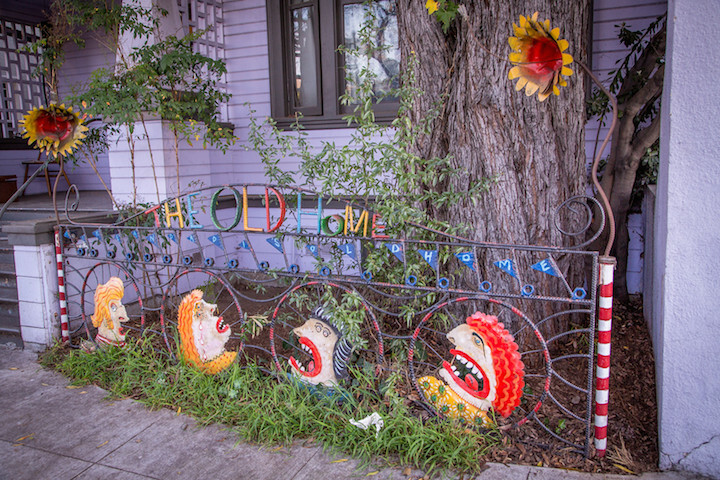 Michael and Becky O’Malley’s fence of doors with ceramic sculptures inset at 2910 Ashby. It is 1.3 miles back to Ashby BART. Not optimal! But great restaurants on College. Lots of choices. Posted in Uncategorized. RSS 2.0 feed. Edit this entry. Logged in as tomdalzell. Log out?